The peasant women’s blouses have ornaments arranged on chest, sleeves and shoulders (altiță and încreț) in one, two or more colors, with geometric, floral, zoomorphic and anthropomorphic patterns. The blouses worn on the hillside have raw silk embroideries on chest. A different style, with extremely long sleeves can be found in Vrancea(img 7). They are crafted from a long triangular piece of fabric, and twisted around the arm. Studies about it’s origins have concluded that it might have been borrowed from the 16th-17th century Western European feudal costumes. A rectangular apron (catrinta) is wrapped around the underskirt and tied with a narrow strap. The peasant man’s blouse is long, straight, and loose, reaching the knee, held by a woven waist belt (barnet). It is made of flax, hemp, cotton, or a thin, woolen hand spun yarn (in Iasi and Vaslui). One hundred and one winkles (101 creturi) are specific to Vaslui, Iasi and Botosani. They are some long and tight trousers, showing wrinkles below the knee (img 4 5 6). The cowhide leather boots and astrakhan hats make them look taller and slimmer. Both men and women wear bundite (leather vests) and sumane cu sarad (woolen coats decorated with woolen plaited cords, usually black). Standing at the crossroads of the commercial routes linking Orient and Occident, manufactured goods were exchanged for raw materials produced in the region of Muntenia. Because of its geographical position, in the late 18’th century, Muntenia gains access to craft supplies, such as metallic thread and sequins, beads, cocoon raw silk (borangic). Raw silk marame shawls are common to the peasant women’s folk costume from Muntenia. In lowland areas of Muntenia, the blouses with straight loose sleeves are woven with thin thread and ornamented with silk stripes, due to the common practice of sericulture in the area. Two aprons are worn over the underskirt, a narrow zavelca at the front, and a wide valnic at the back. A wide pleated skirt (vâlnic) can be found in Teleorman and Giurgiu. The wrap around skirt (fotă) is worn in the highlands of Muntenia (Argeș, Muscel, Bran, Buzău). Queen Marie showed a great preference for the Romanian traditional costume from Muscel, with dazzling silver and golden ornamented wrap around skirts and heavily embroidered blouses. Oltenia region is situated in the south part of Romania. It’s neighbor regions are: Transylvania in the north, Banat in west and Muntenia in the east. From north to south, it features a balanced distribution of the land forms: mountains, hills and plains. The predominant color of the Romanian national costumes in the field area is red. As we climb up to the mountain area, the tones change to brown and black (in Mehedinti, Gorj). The women from Mehedinti county are wearing a pleated wrapped around skirt at the back (vâlnic), a rectangular apron at the front (catrință) over the long blouse with underskirt. Black is the dominant color. A spectacular effect is the use of a thick metallic thread work on the lower end of the vâlnic. Two rectangular aprons (catrințe) are worn in Gorj: a fâstâc at the front, a catrințoi at the back and a vâlnic wrapped round the back, over the catrințoi. The clothing from Gorj is predominantly white, red and blue. Geometric shapes, such as rhombs, crosses, spirals embellish the pleated vâlnic. Red and blue contrasts, a combination of vâlnic at the back and a catrință at the front, or two back and front catrințe, even one pleated vâlnic all around can be found in Vâlcea. Stylized birds and floral motifs decorate the traditional costume from Romanați. Two aprons (zavelci) are worn at the front and back, over the underskirt. The overwhelming dominant color is red. The women from Dolj are wearing pleated wrap round skirts, as well as a front apron and a pleated skirt at the back. The traditional costumes from Dolj are decorated with geometric motifs and stylized two headed dolls. The men’s blouse extends to the knees, and it is made of a thicker fabric in colder regions. In lowland areas, the blouse is made of a thin thread, such as raw silk and cotton, it’s length reaching the ankles. It is tied around the waist with a fabric waist belt. Over the waist belt, they wear a wide leather pocket belt (chimir). In summer, their pants are made of hemp and cotton. Men from north Oltenia, a cold weather area, are wearing tight woolen pants. Straight, loose pants are worn in the south area. The Romanian traditional clothing from Transylvania features two aprons, and a peasant blouse with puffy sleeves and ruffled cuffs. Unlike the typical ie with altiță and încreț, the shoulder ornaments are missing from the peasant blouses from Transylvania. Instead altiță, the Romanian peasant dress from Sibiu feature a thin, horizontal line across the shoulder. The singularity and sobriety of the peasant blouses from Mărginimea Sibiului makes them easy to be identified: long, vertical black or brown fabric stripes (ciocănele, i.e. little hammers) are sewn onto the chest and sleeves, from the collar, and all the way down the ruffles. The variety arises from the different embroideries found on the side of these stripes: plants, animals, tools, fruits, flowers, sewn with black or golden thread. This is a unique headwear (velitură), which is held in place with a fine white veil. The black aprons are made of wool and have gold and black silk embroideries. 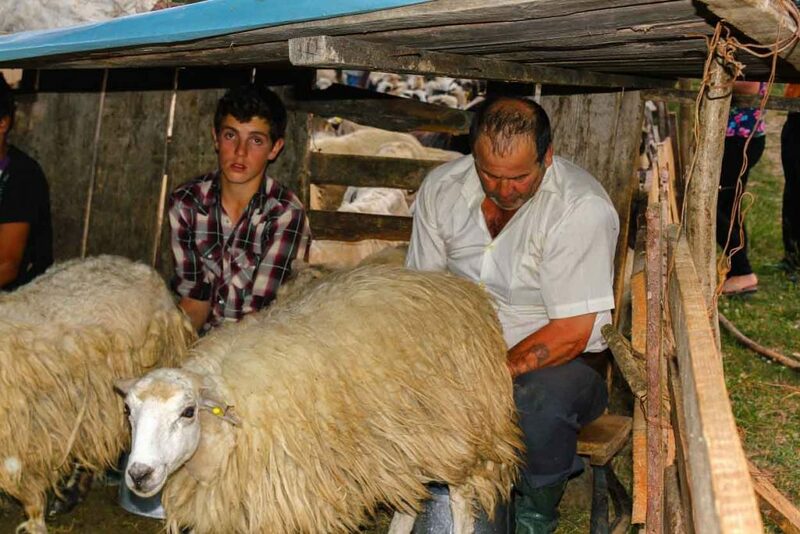 In summer, the peasant men from the county of Sibiu wear a short, circular brim hat, woolen vests and loose blouses. In the county of Brașov, the vertical embroideries (râuri) on the sleeves, the shoulder ornament (altiță), the folded cuffs (cămașă cu pumnași), are influences of North Muntenia (Prahova, Muscel). The old women would wear blouses with folded cuffs, while a young woman would wear a blouse with ruffled cuffs. In Țara Oltului, one could recognize a married woman, who would wear a blouse with a neck design. 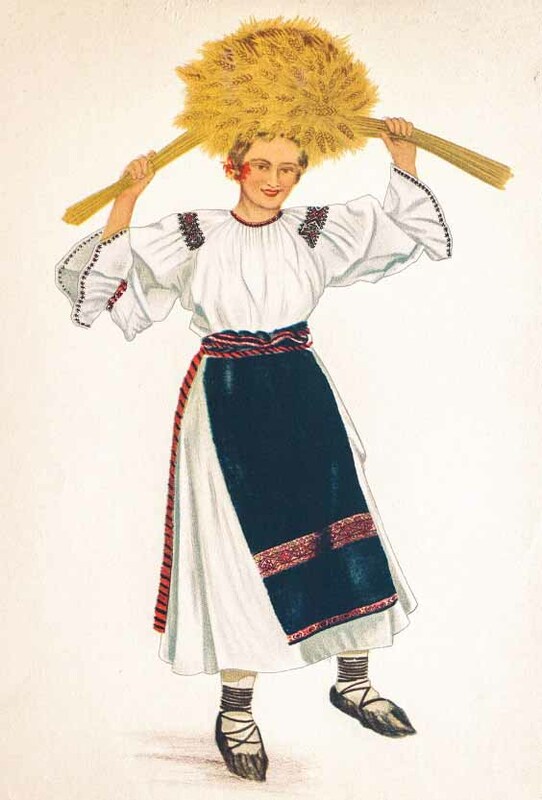 Women wear two aprons with red and black horizontal stripes, or vertical stripes (Muntenia influences). Both men and women wear sheepskin vests, decorated with geometric and floral multicolored motifs, with front or side closure (pieptar înfundat). The peasant women wear two narrow aprons, mostly black, or red and black, with horizontal stripes. One can find a particular type of apron: catrința cu trup vânăt (literary translates to “aprons with a dark purple body”), due to it’s dark purple/ navy blue color. The shoulder ornamentation (altita) is completely removed. A thin horizontal line across the elbows stands for an altiță. The peasant women wear two aprons, black or red and black, with horizontal stripes. The peasant man’s blouses are loose, with floral ornamentation across the neckline, chest and cuffs. A man’s hat embellished with peacock feathers is a sign that the man is not married.